Twitter is adding alternative text support for its Android and iOS apps, which will help the visually impaired access Twitter images. What the feature does is allow users who upload images to Twitter to then tag those pictures with a description. Visually impaired users who take advantage of text-to-speech screen readers or braille displays will then be able to know what’s displayed on-screen. Image descriptions can be up to 420 characters. To add a description, just tap on the pen icon next to ‘add description’ after you upload an image to a tweet. To make sure the update reaches everyone, Twitter has also extended its REST API and Twitter Cards for developers with Twitter clients. Cards will now support metadata, while the REST API has a new metadata API endpoint developers will need to call. The change comes about as a result of Twitter’s #HelloWorld initiative, where CEO Jack Dorsey asked developers to tweet ideas and requests for the service. The ability to add text descriptions to images was the fourth most requested feature. Both the iOS and Android apps are receiving the update today. While adding text descriptions to images is only available for iOS and Android, it can be accessed via mobile, the Web or in syndication (embedded tweets on Websites). 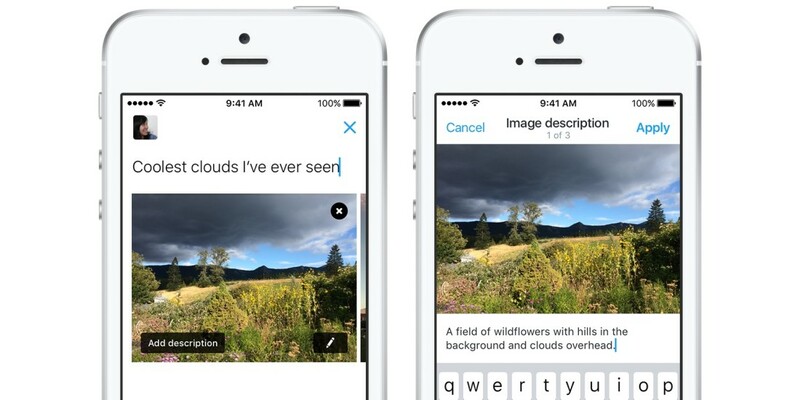 Twitter says it’s working to add image descriptions to twitter.com as well.